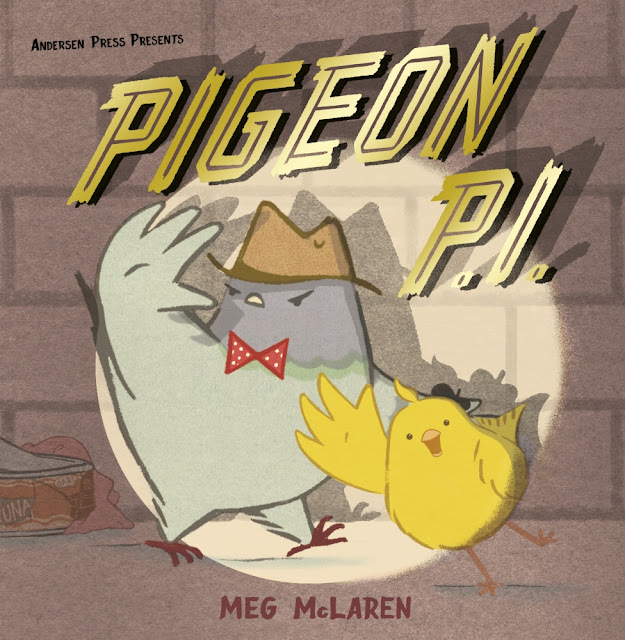 Private Investigator (and pigeon) Murray wants nothing more than to put his feet up and take things easy so when a young and eager canary, Vee, shows up asking where her friends have disappeared to Pigeon P.I. tells her to come back tomorrow. Tomorrow comes and the canary has not turned up. It is weeks until Pigeon P.I. hears anything about the youngster but by then it is too late - she has gone missing too! Pigeon P.I. realises that he has to find out where she has got to. Can he find her in time? Pigeon P.I. by Meg McLaren is a picture book that I would say is aimed at older readers of picture books and at aged 3 (and someone who will happily sit and read books such as The Witches and James and The Giant Peach) did not seem to enjoy this book as much as many other's that she reads. That said it is one that has become a bit of a grower and the book has longevity so may be one that gets a lot of reads as she gets a bit older. This "whodunnit" has an almost comic book feel to it and each page, or double page, has a lot of things to talk about in it. The illustrations are detailed and M does love them but again I would say that they seemed to be aimed more at the older reader and not that is your usual picture book reader. However there is always something for her to point to and ask about. It is quirky and if this is your thing then this could well be the most amazing book for you. At times it felt the book was just too crowed and busy which made it a bit confusing to read. The main story is short and may only be a few words on a page at a time. It is all the added text, speech bubbles etc, that at times, makes it too hard to keep up or to read with ease. The story idea is good. Makes a change from the usual toddler picture book and makes a welcome change to what you usually find. I am not sure I have seen a toddler book that has a crime mystery (my favourite genre) and I would love to read more. It is great to have something different to read. I was given a copy of this book to review. All opinions are mine and mine alone.